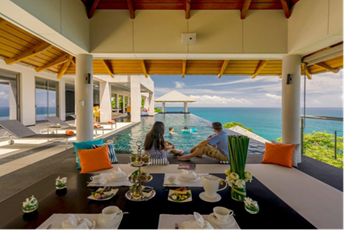 Villa Amanzi, is a six-bedroom luxury pool villa with superb views over Kata Noi Beach. Designed for entertaining, privacy and complete comfort, ideal holiday haven for groups and families,Less than 1 hour from Phuket airport and 15 minutes away from Patong’s nightlife. Package Inclusions and benefits: Services of our Phuket based event co-ordinator (arrangements made in advance),Accommodation for 12 people in 6 bedrooms, each with ensuite,Lounge with bar and study corner, formal dining for 10 overlooking the pool,Outdoor dining and barbecue sala with bar and pool table,Shaded pool terrace with sofa suites, all with superb sea views,15 metre infinity pool,Villa manager, private chef, service staff,Baby-sitter, massage, beauty therapists available on request (additional expense),Wi-fi internet access,Satellite TVs, DVD players. Call or Email for a quote. Set on a serene hillside estate in the coveted Surin Beach area, Villa Baan Bon Khao is an elegant retreat offering breathtaking sea views and exceptional Thai hospitality. 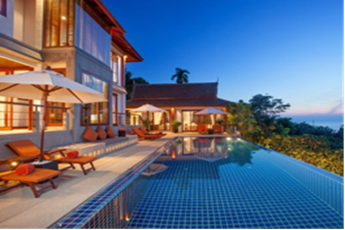 This four-bedroom holiday home blends northern Thai aesthetics and contemporary style. Package Inclusions and Benefits: Services of our Phuket based event co-ordinator (arrangements made in advance),Accommodation for 8 people in 4 bedrooms, two with two singles ideal for families,Lounge pavilion & dining pavilion with table for 10,Outdoor lounge, furnished pool terrace, barbecue terrace dining,12 metre swimming pool,On site villa manager, villa attendants, private chef, 24 hour estate security, Baby-sitter available on request (additional expense),Wi-fi internet access,Flat-screen TVs with international channels in living room and master bedroom,DVD players, iPod dock and MP3 player in living room and master bedroom, CD player in outdoor lounge. Call or Email for a quote. 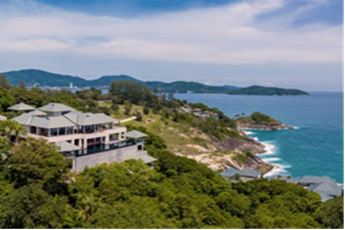 “House on the cliff by the ocean” is the appropriate translation of the Thai name for this superb nine-bedroom luxury villa, spectacularly situated high on a headland overlooking the Andaman Sea between Kamala and Patong on Phuket’s scenic west coast.